Rochester Public Schools is comprised of 17 elementary schools, four middle schools, three high schools and one alternative learning center. Rochester Public Schools strives to inspire, challenge and empower all students with the knowledge and skills required to reach their full potential, to contribute to future generations and to become involved members of a global community. Since 2010, Rochester Public Schools has maintained a managed print environment throughout the district. It had a surplus of devices and was seeking a knowledgeable recommendation for its fleet. When the district decided to send out a Request for Proposal (RFP) in 2015, it had 400 devices in its printing fleet. The goal was to make a 5-10 percent reduction. The selected vendor needed to be able to grow with the district, as it was building a new school, and provide exceptional service and support. “We wanted a vendor who could analyze the data and make a recommendation as to where the devices could be consolidated and eliminated,” said John Carlson, Executive Director of Finance. During the district’s extensive RFP process, it considered three major vendors in Minnesota. Rochester Public Schools had a grading rubric of pricing weighted at 50 percent, and the overall plan of implementation, service and support at 50 percent. “We weighted the estimated annual spend, recommendation and post implementation services, and put all three vendors in line. We perceived that Marco would deliver the best service to us and provide the best overall value,” Carlson explained. “There is a lot of competency in the staff at Marco. They had a strong representation of their performance, which included the implementation and service on the back-end,” Carlson added. 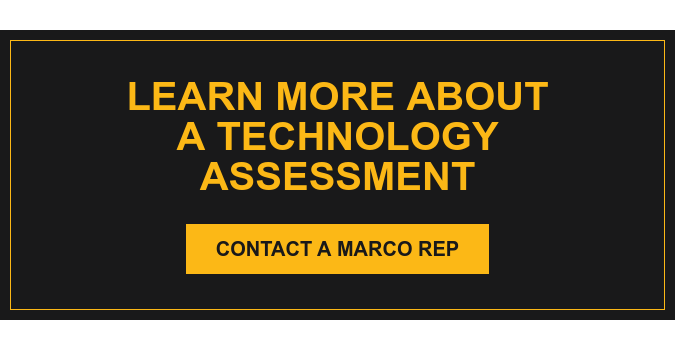 Marco thoroughly analyzed all of the data the district had available for the past five years and was able to recommend about a 13 percent reduction in devices. “Marco basically doubled what we thought we could reduce, so we were very satisfied with that,” said Carlson. The implementation was a very large project. Marco needed to cover 348 devices across 36 different buildings. It was pertinent to the district that it would be a seamless implementation and that day-to-day operations wouldn’t be interrupted. “The overall initial implementation was very well executed and thoughtful. There was a schedule, and that schedule was met. Along the way Marco did training with every department in every building, so that was very well received,” said Carlson. Prior to Marco’s solution, Rochester Public Schools had been using PaperCut, a software that tracks print usage, but it had trouble understanding the full capabilities of the tool. Marco was able to help the district utilize the software in a way it hadn’t before. “Marco is much more competent in supporting PaperCut. There is a notification tool that pops up on each user’s screen, informing them of how much they’ve used and how much is left. It gives us the vision we were looking for to track user by user, and how much they were spending by month. Having that information makes a big difference,” added Carlson.